The Travel Channel premiered a program on October 23, 2006, called “Geldof in Africa.” The two-hour show followed musician Bob Geldof as he toured throughout Africa explaining the complexities of the continent. One of his stops was Somaliland, a country that is democratic and has its own currency, but is not recognized as an autonomous country by the rest of the world. The people of Somaliland got fed up with the violence perpetrated by the warlords in Somalia and decided to secede from Somalia in 1991 so they could live in peace. Meanwhile in Somalia, dozens of tribes are fighting to control the country. Those with the most guns win. Everyone else loses. It struck me that for a proper civilization to develop out of chaos, order is needed, order in the form of a guarantee of safety and security for every person, be they young or old, strong or weak, rich or poor. A truly civilized society is one in which even the most downtrodden have enough standing in the community not to be harmed by those of higher status or those who control the most resources. Although imperfect in practice, we attempt to give the weakest in society protection through laws and through those who uphold the laws – our law enforcement agencies and the courts. In America, we take this guarantee of safety as a given. When someone violates our security by committing murder, assault, robbery, or other anti-order acts, we are justifiably outraged. Someone has breached this order we’ve established. But order was not always here. Take Minnesota, for example. Prior to achieving statehood in 1858, Minnesota was a territory experiencing the upheaval of native tribes who’d been pushed westward by the ever-burgeoning eastern settlements of European/Americans. This upheaval contributed to a contentious rift between the Dakota and Ojibwe tribes, who kept up a running warfare in the territory. Fur trade company employees had been in the Minnesota area as early as 1680, when the Hudson’s Bay Company formed in Canada. Explorers and missionaries followed. All risked their safety by coming into a land unknown to them and occupied by the warring Ojibwe and Dakota, who kept order through their own means and agreements. By the time serious European/American settlement to Minnesota became imminent, the federal government had developed its own system for claiming land from American Indian tribes and creating order. There should be no wonder as to why military men were often sent to explore areas prior to settlement, or why forts were commonly the forerunners to civilian occupancy. Those with the most guns win. Fort Snelling was completed in 1822 near St. Anthony Falls. It was the seat of law and order for Minnesota Territory. Law breakers were sent here for trial and punishment. Settlers could get protection from the fort when needed and pick up supplies before heading into the Minnesota frontier. Fort Ripley was established in Morrison County in 1849 for many of the same reasons. Its protective function, however, wasn’t only about serving the European/American settlers. The fort was also erected to protect the Winnebago Indians, who had been moved into an area between the Mississippi and Long Prairie Rivers to serve as a buffer between the Ojibwe and Dakota. As the European/American population of Minnesota grew, seats of local government – counties and towns – developed. When Morrison County was organized in February 1856, one of the first acts of the Board of County Commissioners was to appoint a sheriff. They chose Jonathan Pugh. They also selected Nathan Richardson as Clerk of District Court and William Fairbanks as District Attorney. That year, District Court proceedings were held at Nathan Richardson’s Little Falls Hotel and plans were made to have a courthouse constructed. The infrastructure of order was laid, right from the beginning of the county. It was also challenged almost immediately. In August of 1857, three men of Indian descent killed a German pack peddler. The men were arrested and turned over to Sheriff Jonathan Pugh, who was taking the men to St. Paul to be tried when all were overtaken by a group of Morrison County men. The prisoners were removed from the sheriff’s custody and hanged near Little Falls. The reason given for the lynching was that the Morrison County men thought that the Indians would not be properly punished in St. Paul. The settlement of Little Falls was having difficulties with a band of thieves and rowdies around the same time. 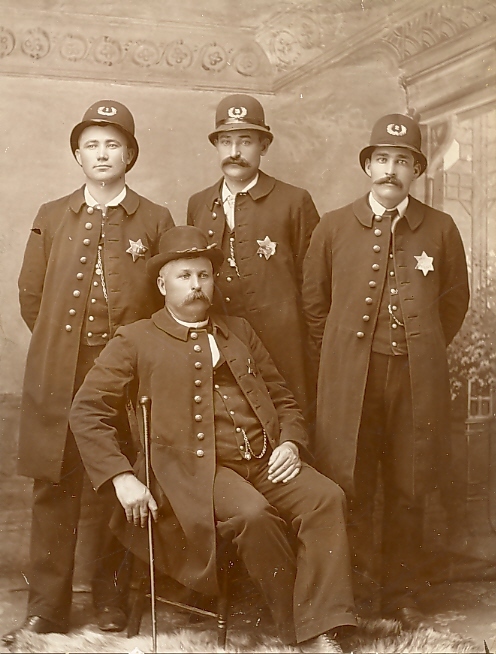 These men, including the sheriff, were causing all sorts of trouble in town, with their lawless antics continuing into the following year and culminating with the savage beating of R. L. Barnum, the justice of the peace. The rest of the townsfolk got tired of this dangerous behavior and declared war on the men. They formed a vigilante committee that eventually succeeded in driving the men out of the county. Even the sheriff had to go. This series of events became known as the Little Falls War. Even though the foundations of order were put in place by the County Commissioners, it was obvious that there had to be some authority behind it. In both of the aforementioned cases, the sheriff’s authority was usurped by private citizens, who wanted more order than he or the courts of the time seemed to provide. County citizens weren’t going to leave their security in the hands of anyone other than themselves, much as current day Somaliland won’t depend on Somalia for its peace. Order is the order of the day, and we shouldn’t take it for granted. Little Falls Police Force of 1890. Chief Thomas Bailey, Jake Mrozik, William Tourtillot, and John Roy. Little Falls, Minnesota, went from being a village to becoming a city in 1889, thus making these men some of the earliest official order-keepers for the city. on this picture which one is john roy? Hi, Mason – I checked the back of the photo and see that there’s a little confusion in how it is labeled. Normally, people are labeled left to right and there’s a list on the back that seems to indicate that John is the one standing on the far right. However, someone has also written William and John’s names on the back in what appears to be their approximate positions, making John Roy the one standing in the middle and William Tourtillot on the right. Jake Mrozik is definitely standing on the left. My grandpa was a Mrozik and Jake looks a lot like him. Jake Mrozik is on the left. He is my great great grandpa! Thanks for the confirmation, Jennell! Was Jake Mrozik married to Praxy or is he from a different Mrozik family? Jay – I’m not sure who this particular Jake Mrozik was married to. We’ve got info on two different Jakes in our Mrozik family file. One was born August 30, 1903 to Joseph and Eva Mrozik. He was married to Agnes Hlad. He died December 20, 1974. The other Jacob Mrozik was born in Poland and married Francis Peplinski in May 1872. He died in 1937. Thank you. Our great grandfather was Jacob and he died in 1946. His last name may be spelled Mrozek in your records. I can be pretty sure from what you said of the other two Mroziks that the Jacob in the picture is not our Jacob. I appreciate your response.